At first, château meant a fortress [château fort]. It was originally equivalent to the English word castle. 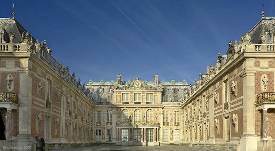 However, during the Renaissance period, it took on the additional meanings of royal palace and mansion or stately home. By the 15th century castle architects were designing imposing residential tower houses within the castle grounds, which were fitted for elegant living. Examples of such castles are found at Tattershall, in England and at the magnificent Château Vincennes near Paris. The words castle and palace, do not have the same meaning in English, even though they have been loosely used interchangeably; strictly speaking castles are fortifications while a palace is the residence for the kings and the nobility. Whereas, the French word château [châteaux is the plural] is multifaceted. Over the years it has added new meanings while maintaining the old ones. So we have in French, château country house or royal residence [châteaux de plaisance]. Examples of the châteaux de plaisance are Amboise [15th-century], Azay-le Rideau [1518 - 1527], Blois [13th-century], Chambord [1519 - 1547], and Chenonceaux [1515 - 1523]. By the time the château de Versailles was being built [17th Century], the château no longer resembled the medieval castle. Château roofs had become lower and the structures were more rectangular. The need for fortified châteaux had virtually vanished. In their place, elegant palaces and mansions appeared, having extensive formal gardens. By the 20th and 21st centuries, the word château has become associated with a wine producing estate [such as the famous Château Lafitte-Rothschild]. The peaceful, timeless, wooded Loire Valley, running through the regions of Centre and Pays de la Loire [Western Loire], is often referred to as the Châteaux de la Loire due to its many historic châteaux. In France, the so-called house of cards is known as a Château de carts and a French water tower has become a Château d'eau [a water castle]. For more information about Chateau - try our Chateau Books selection or Chateau Videos. Enjoy!